Belonging to the late Tony Pailthorpe, the collection of International Harvester Company agricultural machinery was believed to be the largest in the southern hemisphere. Organised by his three children, the sale at Aberbechan farm in Benger was an emotional day for Mr Pailthorpe's friends and family. "It's very bittersweet," said his youngest daughter, Christina Denton. "I'm feeling very sad to see it all go because it's like seeing Dad walk out the gate again." Mr Pailthorpe was remembered on the day for his passion for vintage equipment, having amassed about 1,000 pieces before his sudden death from a stroke in 2013. 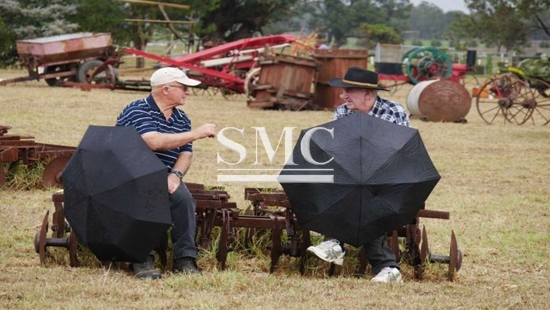 Despite bad weather, hundreds of people turned out from around the country to attend the auction, with bids also coming in from the US, China and New Zealand.